An orientation workshop on media’s role and responsibility to ensure free and fair elections were organized by the Prasar Bharati, Leh on March 31 at DC office conference hall. News and Programme staffs of Prasar Bharati, Leh and Kargil district and the local media persons of Leh attended the workshop. Avny Lavasa, DC/ District Election Officer, Leh said that a greater responsibility lies with the media for ensuring credible elections by disseminating realistic and rational information without being biased and subjective. She sought full cooperation from both electronic and print media with the election authority for a transparent poll which is imperative to further deepen the democratic credentials of India which has a distinctive history of 70 years. She said that with the evolution of strong and popular social media, the task of accurate reporting becomes more challenging for the media these days. Hence, asked media person to be more careful and watchful on all political activities through responsible reporting. Also, maintaining self-regulation so that their works and actions are in the interest of larger society. She also spoke on various rules of model code of conduct and answered various queries raised by media persons. Moses Kunzang, Additional District Development Commissioner, Leh said that media is the most important and responsible stakeholder in holding free and fair elections and urged them to familiarize with the rules of Model Code of Conduct. He highlighted other provisions of monitoring mechanism such as videography of polling, surveillance teams and flying squads on all polling process. He sought media’s cooperation in maintaining law and order for peaceful conduct of the election. Sachin Kumar, ADC underlined the importance of rights of voting and Model Code of Conduct. Talking about the functioning of VVPAT, he said that it is a feedback mechanism to authenticate the vote as to whom it was actually cast. He strongly urged people to have complete knowledge about the functioning of VVPAT. 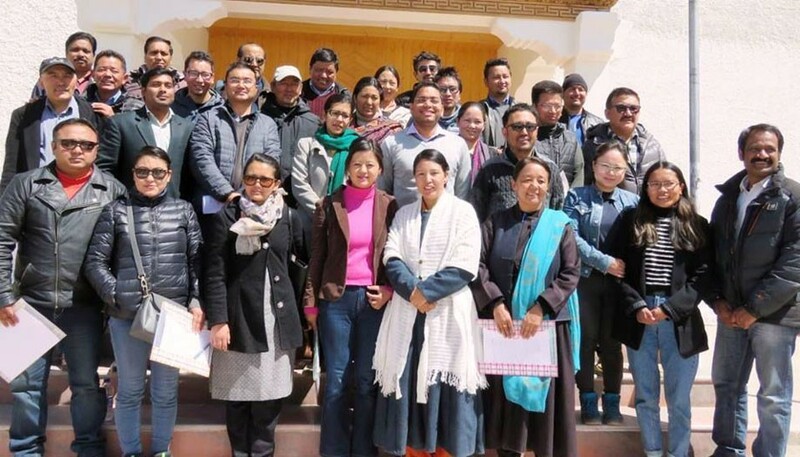 Tsewang Rigzin, Journalist said that Leh for the first time is going for elections with a strong social media with 4G connection and urged upon all social media groups to become more careful and cautious by avoiding irresponsible statement, fake news, unwanted rumours and provocative messages. Ramesh Chandra, Incharge, RNU, Prasar Bharati Leh urged for maintaining media’s credibility and ethics by treating all political parties in an unbiased way. He impressed upon all his media colleagues to ensure the authenticity and credibility of all political news so that it would help in conducting fair and peaceful elections. Zakir Hussain, Nodal Officer, Media Certification and Monitoring Committee (MCMC) gave a presentation on the role and responsibility of MCMC in maintaining a peaceful environment for elections. Thinles Dawa and Mohd. Ayub, Nodal Officers of EVM/VV PAT demonstrated the working and functioning of EVM/VVPAT machines.